Almost one-half of the Philippines' 400 rivers are characterized as biologically dead due to contamination from industrial and residential run-off and inadequate sewerage and drainage infrastructure. In Indonesia, clean piped water is unavailable to 80 percent of the population, and the rate of new connections is not keeping pace with the growing demand. 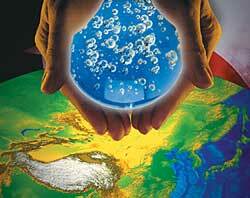 Growing water scarcity and water pollution are among the most severe environmental problems in India. In rural areas, only approximately 46 percent of the population has access to water. In Sri Lanka, the use of groundwater, the main source of drinking water for roughly half of the country's rural population, is unregulated -- resulting in saltwater intrusion due to over-pumping in coastal areas and contamination in others. The majority of the nearly 90 wastewater treatment plants built in Thailand are not operating. Finding appropriate technologies and improving operation and maintenance are of critical importance, as construction is planned on additional plants in the near future. A network of rivers, lakes and streams in Hanoi, Vietnam, is receiving waters from untreated sewerage, partly through open sewer canals. Flooding, stormwater run-off, industrial pollution and solid waste also contribute to water resource degradation. Formed in 1992, the United States-Asia Environmental Partnership (US-AEP), a public-private and interagency partnership led by the United States Agency for International Development (USAID), strives to address issues like those outlined above. US-AEP promotes sustainable growth and improved conditions in Asia by shaping policy, improving industrial efficiency and urban planning and facilitating the transfer of technology from the United States to Asia. In the past, US-AEP has worked in Korea, Taiwan, Hong Kong, Malaysia and Singapore. Currently, the program focus is in India, Indonesia, the Philippines, Sri Lanka, Thailand and Vietnam. US-AEP engages and mobilizes the U.S. public and private sectors -- with their innovative and cutting edge technologies, experience as a global leader in environmental management and renowned engineering expertise -- to meet the needs of developing Asia. Working in partnership with U.S. companies, trade and professional associations and state and local government institutions, US-AEP seeks to foster new ideas and creative approaches for the adoption of sustainable economic and environmental policies and practices in Asia's public and private sectors. By matching U.S. environmental experts with Asian stakeholders, US-AEP has impacted every major environmental sub-sector. In addition to water/wastewater treatment, US-AEP is active in such sectors as solid and hazardous waste, clean and renewable energy air pollution and environmental management. This article discusses US-AEP's technology transfer strategy for addressing Asian water and wastewater problems and provides examples of projects -- both past and present -- that reflect US-AEP's methodology. One of US-AEP's fundamental strategies for linking solutions to Asian environmental problems is to engage the American business community and its vendors to transfer their technologies and practices to Asia. Since its inception, US-AEP has matched over 700 Asian and U.S. stakeholders for the successful transfer of $1.4 billion of environmental technologies. US-AEP utilizes a number of activities, including training, workshops, exchanges and small grants, to facilitate this transfer. For example, US-AEP has serviced over 5,000 technology requests from Asia and has successfully matched them with U.S. environmental companies from 45 states. The benefits of US-AEP's technology transfer strategy are that it improves the flow of environmental technology, creates long term partnerships, builds capacity, increases access to U.S. cutting edge technology, provides infrastructure support for developing Asian countries and creates jobs for Americans. As a result, in January 2002, the US-AEP received the Government Award from the Environmental Business Journal for its innovative approaches. US-AEP works to help Asian economies with their adjustment to globalization by improving their competitiveness and their ability to engage in and maintain commitments to international trade agreements. US-AEP was recently singled out in a U.S. Trade Representative report delivered to a recent World Trade Organization meeting for its work "to strengthen developing countries' analytical, policy and institutional capacities with respect to trade, investment and the environment.1"
During preliminary drafting of a bid for a major desalinization plant in Singapore, the Public Utilities Board of Singapore was only interested in Multistage Flash technology. Realizing that other technologies may be more energy efficient in Singapore, US-AEP referred several U.S. firms with alternative technologies, such as reverse osmosis or hybrid technologies. Subsequently, the Public Utilities Board chose to consider all technologies that met their basic technical and strategic specifications. By opening the bidding process to a wider array of technologies, US-AEP increased the potential flow of environmental technologies and the possibility that Singapore will choose the most appropriate technology for their needs. There are many ways for the diffusion of environmentally sound technologies to occur within Asian economies. Long-term relationships between the United States and Asia are one important way to achieve the adaptation of technologies to local conditions. One success story is recapped below. A mechanical vapor recompression wastewater evaporation system that is a chemical-free, energy efficient wastewater processing alternative that reduces wastewater volume by 95 percent and produces clear, low-pollutant condensate that can be reused for industrial processes. Representatives of water utility associations in the Philippines, Indonesia, Thailand, Malaysia and Vietnam met in Hanoi in 2002 to form the Southeast Asian Water Utilities Network (SEAWUN). Established with assistance from US-AEP and one of its partners, the Asian Development Bank, SEAWUN will address issues related to the management of municipal water systems and promote information sharing, advocacy, policy reform and regional cooperation between water utility associations in Southeast Asia. Collectively, this group of associations represents over 2,000 water utilities. Increased regional cooperation among the associations in the areas of performance monitoring, benchmarking and training will accelerate improved delivery of piped water for urban areas. A select group of mayors, municipal commissioners and utility managers from China, India, Indonesia, Philippines, Thailand, Vietnam and Cambodia met in Honolulu in 2001 for the inaugural Asia-Pacific Urban Institute Executive Seminar. US-AEP took a leading role in organizing the Seminar with the city and county of Honolulu and the USAID Water Team. The inaugural seminar focused on a planning and implementation process that brings together stakeholders in order to meet society's long term needs for water resources, while maintaining ecological services and economic benefits. It was organized into two programs -- one targeting senior water utility managers and the other city leaders. The water utility managers' program focused on the principal components of integrated water resource management. The city leaders focused on examining specific water and sanitation issues in the context of finance, public/private partnerships, infrastructure and service design, technology, operations management, community participation and political will power. Throughout the week, decision-makers and practitioners worked together to discuss local water resource issues and formulate plans of action upon their return to their cities. At the end of the conference, over 25 Asian municipal representatives pledged commitments to address environmental issues in their cities. The United States is a renowned innovator of new technologies that overcome a wide range of domestic environmental pollution problems. Most of the Asian countries in which US-AEP works do not have the capacity for research and development enjoyed by the United States. As a result, the U.S. environmental industry has many of the technologies, practices and experiences that Asian public and private sector decision-makers seek, such as arsenic removal. Arsenic poisoning from contaminated wells and underground water supplies is a major public health issue that has reached epidemic proportions among the six million inhabitants of West Bengal and Bangladesh in India. US-AEP worked with U.S. firms to find cost effective, commercialized technologies to remove arsenic from Indian drinking water supplies. Working with the Central Ground Water Board and Rajiv Gandhi Drinking Water Mission, US-AEP identified two internationally recognized compact treatment systems for arsenic removal that met the needs of the West Bengal and the Rajiv Gandhi Drinking Water Mission. In 2001, $4 million of water treatment equipment was purchased from Apryon Technologies and Water Systems International, marking an essential first step in providing clean water to millions of people in west India. A vital resource for the health and economic well being of Asia's growing population is an infrastructure that provides basic environmental services. The combination of a renowned U.S. engineering industry and a sophisticated U.S. financial sector make the United States an attractive partner in engineering, financing, construction and management of Asia's environmental infrastructure. The following example shows the USAEP's strategies at work. By supporting the travel of the founder of Clean-Flo International (CFI) of Minnesota to the states of Andhra Pradesh, West Bengal, Kerala, Karnataka, Chennai and Delhi, US-AEP facilitated the introduction of "waterbody restoration technology" to India. CFI's unique technology is cost effective and virtually maintenance free. It removes bottom organic muck; improves fish growth and health; reduces aquatic weeds, algae, foul odors and disease bacteria; and reduces mosquito infestation. Thanks to CFI's efforts, Lake Kachreli, near Maharashtra, which was once choked with weeds and algae, has now seen a significant increase in clarity and oxygen levels. US-AEP also coordinated meetings for CFI with Indian federal and state officials, the World Bank and the World Health Organization to discuss future water body restoration solutions and to learn about on-going river and waterbody conservation projects. As a result of these meetings, several proposals were made to CFI by India's National River Conservation Department and Karnataka Pollution Control Board for the clean up of the Yamuna River, which runs through Delhi, and lake restoration in Andhra Pradesh. The US-AEP is a unique USAID program that focuses on the nexus between trade, environment and development to address Asia's increasing industrial and municipal pollution problems, The program seeks to promote U.S. technologies, experiences and practices for sustainable economic growth in Asia by using a variety of flexible and responsive mechanisms. This article on water and wastewater is illustrative of US-AEP's approach to engage the American business community and its vendors to transfer appropriate technologies for pollution prevention or remediation.